Researchers worldwide are on the hunt for novel materials that can improve the performance of basic components required to develop organic electronics. Now, a research team at Tokyo Tech’s Department of Materials Science and Engineering including Tsuyoshi Michinobu and Yang Wang report a way of increasing the electron mobility of semiconducting polymers, which have previously proven difficult to optimize. Their high-performance material achieves an electron mobility of 7.16 cm2 V-1 s-1, representing more than a 40 percent increase over previous comparable results. 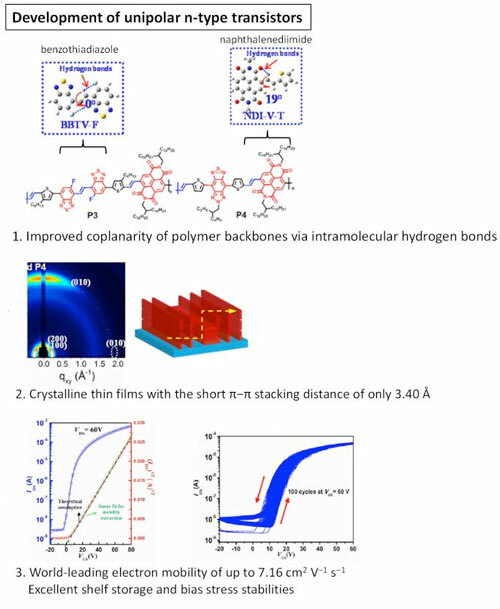 In their study published in the Journal of the American Chemical Society (« Significant Improvement of Unipolar n-Type Transistor Performances by Manipulating the Coplanar Backbone Conformation of Electron-Deficient Polymers via Hydrogen Bonding »), they focused on enhancing the performance of materials known as n-type semiconducting polymers. These n-type (negative) materials are electron dominant, in contrast to p-type (positive) materials that are hole dominant. « As negatively-charged radicals are intrinsically unstable compared to those that are positively charged, producing stable n-type semiconducting polymers has been a major challenge in organic electronics, » Michinobu explains. The team’s method involved using a series of new poly(benzothiadiazole-naphthalenediimide) derivatives and fine-tuning the material’s backbone conformation. This was made possible by the introduction of vinylene bridges capable of forming hydrogen bonds with neighboring fluorine and oxygen atoms. Introducing these vinylene bridges required a technical feat so as to optimize the reaction conditions. Overall, the resultant material had an improved molecular packaging order and greater strength, which contributed to the increased electron mobility. Using techniques such as grazing-incidence wide-angle X-ray scattering (GIWAXS), the researchers confirmed that they achieved an extremely short π-π stacking distance of only 3.40 angstrom. « This value is among the shortest for high mobility organic semiconducting polymers, » says Michinobu. Wang points out that the lowest unoccupied molecular orbital (LUMO) levels were located at -3.8 to -3.9 eV for the reported polymers. « As deeper LUMO levels lead to faster and more stable electron transport, further designs that introduce sp1-N, fluorine and chlorine atoms, for example, could help achieve even deeper LUMO levels, » he says. In future, the researchers will also aim to improve the air stability of n-channel transistors — a crucial issue for realizing practical applications that would include complementary metal-oxide-semiconductor (CMOS)-like logic circuits, all-polymer solar cells, organic photodetectors and organic thermoelectrics. Vinylene bridges: Structures that are known to be effective spacers based on previous studies. These spacers had never been used in the context of polymers that were the focus of this study. π-π stacking distance: A measure of how far the charge needs to be carried within the material.